Age impacts the body in a variety of ways, especially on the face in the form of wrinkles, lines, and folds. Fortunately, companies like Allergan have formulated dermal fillers that can subtly, naturally, and effectively replace the facial volume lost with time in order to fill and eliminate unwanted wrinkles. Juvederm Vollure™ XC, which received its FDA approval in March 2017, is the newest addition to Allergan’s Juvederm family of fillers. It is the first and only hyaluronic acid filler using Vycross technology to be FDA approved for the correction of moderate to severe facial wrinkles and folds for up to 18 months. Vollure™ XC can be used to treat bothersome nasolabial folds, which run from the side of the nose to the corners of the mouth, and marionette lines. Vollure is composed of hyaluronic acid, one of the naturally existing components of healthy skin that encourages hydration and volume. 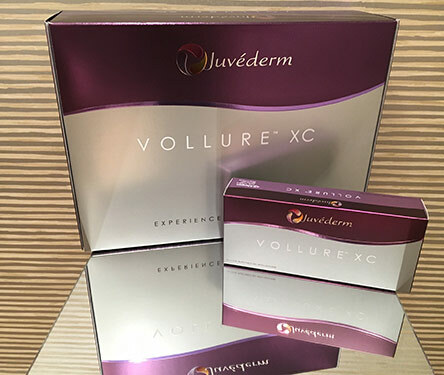 Juvederm’s special Vycross technology is utilized in Vollure to blend high and low molecular-weight hyaluronic acid, which creates a more connected gel that can be subtly molded to lift the sunken skin that forms wrinkles and lines. Vycross technology produces a durable hyaluronic acid gel that produces long-lasting results for 18 months or more. Vollure™ XC is the ideal dermal filler for patients who want to reduce wrinkles, folds, and lines on the face. Younger clients with minimal folds and wrinkles can benefit from Vollure to maintain their youthful volume and prevent or reduce fine lines. For clients approaching middle age, Vollure is a valuable treatment for resolving moderate to severe wrinkles and volume loss. Since results last at least 18 months or more, only an occasional touchup is needed to maintain the smooth, youthful appearance that Vollure creates. Vollure also contains a small quantity lidocaine, which serves as a local anesthetic to minimize any pain associated with the injection. Thanks to lidocaine, the Vollure treatment is comfortable and easy. Furthermore, studies have shown that the new Vollure formulation causes less inflammation after treatment than other hyaluronic acid fillers. Other side effects, like minor bruising and slight tenderness, resolve themselves within a week or less. Hermann Wellness is proud to be one of the first to offer this highly effective and long lasting service for our clients. Vollure aims to increase self-confidence by improving folds and wrinkles, helping bring a smile to the faces of those who choose to embark upon this exciting cosmetic treatment. Call our office to make an appointment with one our highly trained and experienced providers in St. Petersburg ((727) 278-3992) or Tampa ((813) 902-9559).